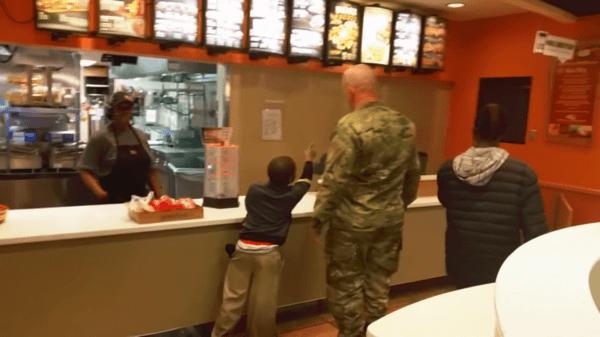 This act of kindness from 2016 is still making the rounds today. 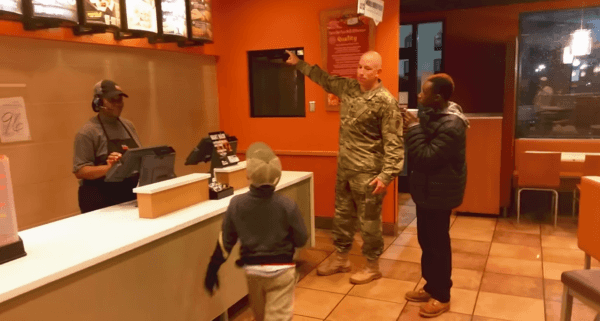 Lt. Col. Robert Risdon was headed back to Fort Benning, Georgia from Alabama, with his friend on January 26th, 2016, when they stopped in at a Taco Bell in Greenville, Alabama to get some food. While they were there at the store, two boys, aged 9 and 12 years respectively, walked in trying to sell some “homemade baked goods”. The boys came up to Risdon and asked if he would like to buy some. Risdon didn’t have any cash on him, so instead, he decided to buy the boys dinner. Risdon described the brothers as “great kids” and “super respectful” to ABC News. He said that the boys were soaked from the rain and looked hungry. When he asked them, they said yes, and he offered to buy them dinner from the menu. Little did Risdon know that his friend Jason Gibson caught the whole thing on camera. He later posted the video on his Facebook page, and has been viewed over 1,800,000 times shared over 39,000 times. Risdon said that he was “blown away” by the reaction his act or kindness had received. He also revealed that in the three days since the video was posted, he had received messages from people from all over the world. He admitted that he was embarrassed about all the exposure and that he did not deserve the attention he was receiving. He told the boys not to pass up an opportunity when they were older and in a position to help.